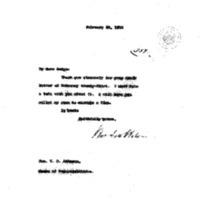 Woodrow Wilson replies to William C. Adamson. Thank you sincerely for your frank letter of February twenty-third. I must have a talk with you about it. I will have you called up soon to arrange a time. Wilson, Woodrow, 1856-1924, “Woodrow Wilson to William C. Adamson,” 1914 February 25, WWP18377, First Year Wilson Papers, Woodrow Wilson Presidential Library & Museum, Staunton, Virginia.